Boil the eggs for 8-10 minutes. Peel and cut about a quarter off one side. Discard the yolks. Boil sweet potatoes until fork tender, about 15 minutes. Peel and grate into long strands using a cheese grater. Lightly toss corn flour, grated sweet potato, salt, and pepper in a bowl. Do not mash. Coat a mini muffin tin with non-stick cooking spray. 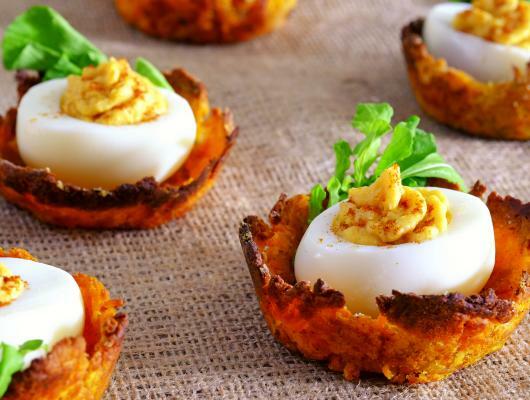 Press the sweet potato mix lightly into each cavity shaping them into nests. Bake for 15-20 minutes at 180C/355F. Puree corn, chickpeas, and coconut milk, paprika, salt, and pepper in a food processor. Put the mixture into a piping bag. Pipe the mixture into the boiled eggs. 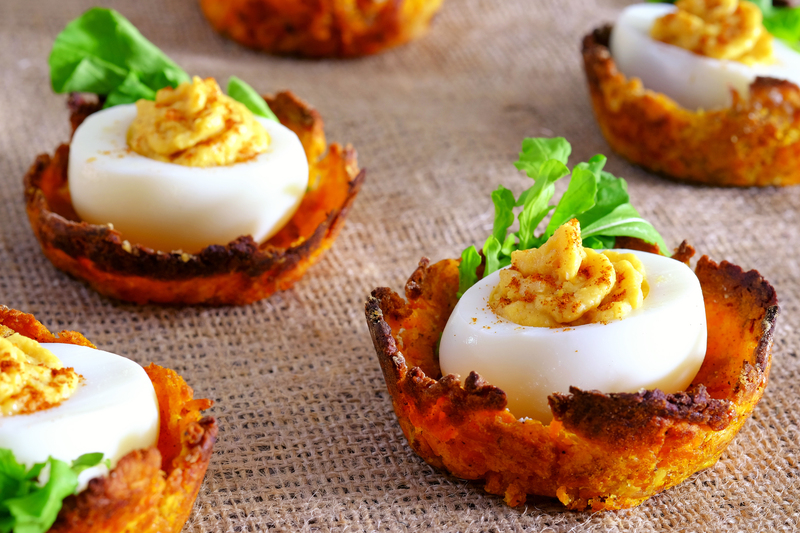 Set the filled eggs on the baked sweet potato nests and garnish with arugula leaves to serve. World Egg Day is celebrated every year on the second Friday in October and this “eggcellent” form of protein is a great way to mark the day. These eggs are tucked securely in their nests and full of lots of things to make your body happy. Eggs are full of protein to keep your body running smoother and more efficiently. They also promote healthy brain development. The sweet potatoes have many vitamins and minerals that your body needs, like vitamin B6, vitamins C and D, iron and potassium. Sweet potatoes and the chickpeas, both, help to regulate blood sugar. They also control heart disease by lowering blood pressure and controlling your heart rate. Chickpeas are one of the oldest known eaten crops in the world. They are primary in the diets of some of the healthiest regions of the world. Boosting your immune system is also one of the many benefits of adding chickpeas to your daily menu. Chickpeas are a great food when you are trying to lose weight because they make you feel full for longer periods of time and boost your body’s natural digestion processes. So, no matter what your personal health objectives are, these snacks will have you flying from your nest and on your way to achieving your goals.